When an avid outdoorsman marries a devotee of Crystal Coast no-wake zones, compromise is a necessity. For once, this is not about me. I promise. As we approach the sandy spit of Carrot Island, I throttle down the boat motor and settle into putt-putt mode as we push into Taylor’s Creek. Beyond a thicket of sailboat masts, the Beaufort waterfront rises over the harbor in a palisade of historic storefronts. The boat is barely moving now. The run all the way up Taylor’s Creek, from one end of Beaufort to the other, is three and a half miles, and the entire body of water is a no-wake zone. That means boaters can run at little more than an idle. My 150-horsepower motor can push us at close to 50 miles per hour, but not at the moment. We creep along the waterfront, chatting about the boats moored at the docks, the shops lined up like toy soldiers. Every dog deserves a comment. My wife, Julie, lies back in the sun on the casting deck. 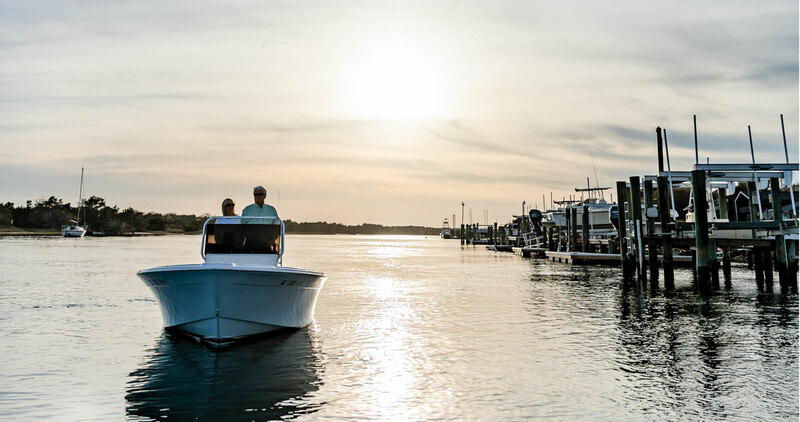 She loves nothing more than to putter this 20-year-old boat around the North Carolina coast, the slower the better, and the run up the Beaufort waterfront is her favorite place in the world. We make this little cruise a dozen times each summer, and the first time or two is a treat for both of us. But they call this a “powerboat” for a reason, and Julie knows that my skin starts to crawl after just a few minutes of slow-motion boating. Honestly, I could paddle this hunk of fiberglass faster than you can motor through a no-wake zone, and while I appreciate a tranquil cruise as much as anyone — well, really, I don’t — after a bit, I get the jitters. Julie and I have been married for 27 quite happy years, and you don’t reach that landmark — in either category, years or satisfaction level — without some nimble accommodation. To wit: Julie and I divide the annual calendar into two roughly equal parts. September through March is known as “His Time.” This is the season of seasons — dove season, deer season, squirrel season, duck season. Julie knows how much I love to hunt, and muck about in swamps, and chase things with wings. “You’re happier when you do the things that make you happy,” she says. “So I want you to go do them.” During hunting season, bless her heart, she does everything she can to maximize my ability to do what I love. The remainder of the year, April through August, is “Her Time.” And she wants to spend as much of it as possible within toe-dipping distance of salt water. (Half of you just ran the math. We sort of split September, understand. No nasty letters, please.) Julie loves nothing more than to be on our boat, which we keep in Morehead City, and ride the protected waterways that spiderweb in every direction from the Crystal Coast. In fact, these boat trips have provided the DNA for Julie and me as a couple, and, with our kids, as a family. North Carolina offers an astonishing assortment of boat routes for folks with just a medium-size craft. From Raleigh, we can trailer the boat to Castle Hayne and drop it into the Northeast Cape Fear River at the Interstate 40 bridge, then spend the day monkeying our way to the Wilmington waterfront. Starting at the Jacksonville docks, we’ve cast off for weekend trips to Swansboro, down the New River to the Intracoastal Waterway. The run from Morehead City to Oriental is a favorite, especially during the Croaker Festival, when we know we can refuel with a hot crab cake sandwich and funnel cake. But it is this singular turn from Beaufort Inlet into Taylor’s Creek that seems to define, in some ways, our marriage. We’ve learned to navigate life’s frequent shifts from high-speed to slow, from calm waters to chop. That doesn’t mean we still don’t take some water over the bow. We’ve run aground a time or two. But making each other’s passions a priority has given us a way to chart the long course. And I’ve learned to appreciate the slow route. Sort of. I sit back behind the wheel and feel the engines calm their racing — the boat’s and my own. We leave the commercial district behind and cruise past massive old homes capped with widow’s walks. The Shackleford Banks horses ignore us in curmudgeonly fashion. Julie stands up from the bow of the boat and takes a seat beside me at the helm. She slips her arm around my waist, and we poke and putter up Taylor’s Creek at speeds that can sometimes reach 100 feet per hour. If I reach for the throttle, she glowers. She’s well on her way to her happy place. At this rate, we should get there by next Thursday.